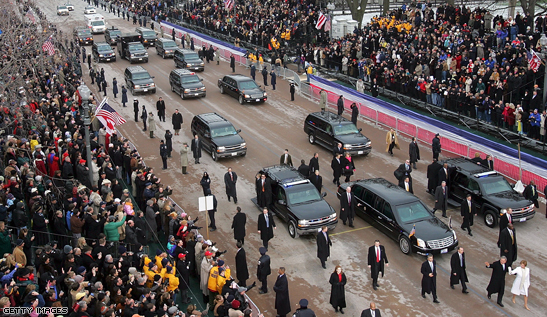 The road to the White House, as the Beatles might have said, is long and winding -- and the 2008 contest is no exception. Campaigning started earlier than ever, with candidates running at a breakneck pace a year before any votes were cast. The road includes major stops in Iowa, New Hampshire, South Carolina and Nevada, a semi-national primary on February 5, national party conventions in Denver, Colorado, and Minneapolis-St. Paul, Minnesota, a national Election Day in November and a meeting of the Electoral College in December -- with dozens of filing deadlines and thousands of fundraisers, chicken dinners and campaign stops along the way. And it all leads to Inauguration Day in January 2009, when the new president and vice president take office on the steps of the Capitol in Washington. The early primary season did little to determine a solid front-runner for either party's nomination. Each of three Republican front-runners won somewhere in the early races, while Democrats Barack Obama and Hillary Clinton traded states, each seemingly capable of winning the party's nod. Voters cast ballots in 24 states on Super Tuesday, but did not decide either party's nomination. On the Democratic side, Barack Obama won more states than Hillary Clinton, but Clinton won states with higher delegate counts. In the Republican race, John McCain gained an edge for his party's nomination but could not finish off his rivals. Following Super Tuesday, Democrat Barack Obama won a string of contests -- including primaries and caucuses in Virginia, Maryland, Washington and Maine -- and built a considerable lead among pledged delegates. Republican John McCain, meanwhile, closed in on his party's nomination. John McCain clinched the Republican Party nomination by winning Ohio and Texas with considerable margins on March 4. On the Democratic side, Hillary Clinton won three of the four states on March 4 -- Ohio, Texas and Rhode Island -- giving her campaign a much needed boost. Her rival, Barack Obama, however, still held a substantial pledged delegate lead at night's end. Democrat Hillary Clinton won the state of Pennsylvania by nearly 10 percentage points, casting doubts on rival Democrat Barack Obama's ability to close out the primary race. All eyes turned to early May, with contests scheduled in Indiana and North Carolina. Democrat Barack Obama crushed fellow Democrat Hillary Clinton in North Carolina and kept it close in Indiana, bringing him to the brink of the party's nomination on May 6. He clinched the nomination on June 3, the final day of the Democratic primary season. His rival, Hillary Clinton, conceded the race a few days later. Delegates wave signs during the Republican National Convention in August, 2004. The presidential prize is in sight as the nation's registered voters head to the polls on the first Tuesday in November to decide who'll lead the country. November 4 is Election Day in 2008, with polls opening as early as midnight in Dixville Notch, New Hampshire, and finally closing in Hawaii and Alaska. but a series of 51 state-level elections that decide the members of the Electoral College. Technically, voters aren't choosing a candidate but a slate of electors who have pledged to vote for that candidate when the Electoral College meets. votes. With 538 electors up for grabs, the candidate with more than half -- 270 -- wins the presidency. The number of electors from each state equals the number of senators and representatives the state sends to Congress. If no candidate receives 270 electors, the House of Representatives decides who the next president will be. preparations already have begun for a presidential transition (if necessary) and the inaugural ceremony on the Capitol steps on January 20. Learn about the history behind presidential debates and see a calendar of this year's schedule. Before you cast your ballot on Election Day, see where the candidates stand on the issues. Answers to some of the most frequently asked questions about the Electoral College. Because they take place before any primaries, the Iowa caucuses play a unique role in American politics. Who were the Democratic superdelegates for your state and who did they support? CNN.com defines all those terms you've been hearing on the campaign trail but were afraid to ask about. A guide from CNN Student News to help you understand the primaries process. From roll call votes to nominations, learn the language and process behind modern party conventions. Conventions may not hold much suspense anymore, but they still help the parties sell their hopefuls. Check out some highlights from past conventions, including riots, a 'smoke-filled room' and a kiss. A guide from CNN Student News to help you understand political conventions. Find your Election Day voting location using Google Maps. You'll only need your home address and ZIP code. States across the country have different ID laws for voting. What are the laws in your state? Check out this interactive for details on the three most common kinds of voting machines. iReport Film Festival: Campaign 2008! Excited about the election? We want YOU to make a short film for the iReport Film Festival, an online festival of short films from the campaign trail!